If you have been anything of a regular reader of this blog, you probably realize that I am a fan of the EA Tiger Woods video game series. I’ve purchased every edition since I got my Xbox 360 about six years ago. And to be honest, I have usually pre-ordered it from Amazon or gone out the first day it was available and bought it. Sometimes there have been good reasons to buy immediately. There was the year that Hazeltine National Golf Club was in the game for the first time. Last year, Augusta National was in the game for the first time. But I’ve been trying to hold out this year. I didn’t buy it when it was released a few weeks ago. But last night I saw this at Target. 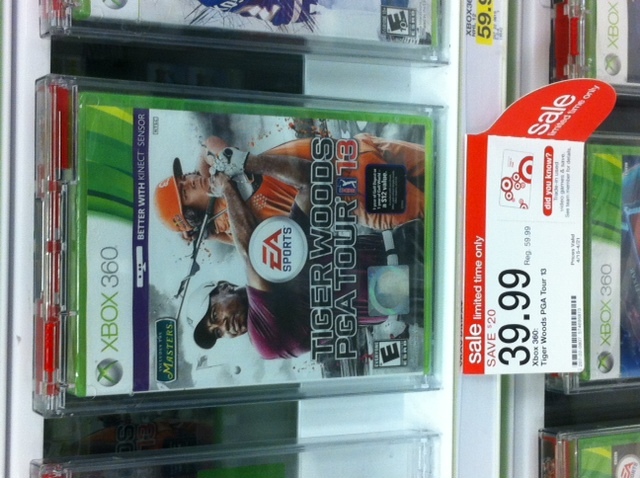 So there you go, Tiger Woods 13 at $20 off the original price. Will I be able to hold out? Or will I return to Target before the sale expires on Saturday? I’m not really sure. I didn’t buy immediately this year because, honestly, I still have a lot to play on TW12. I go on streaks when it comes to playing video games. I will play a lot for a few weeks and then go a week or two and not play. Or I’ll play other games. Right now, I’ve been playing more MLB 2K12 and haven’t played TW12 in probably a month. I also like the NCAA Football game, Madden, some NBA and even the FIFA game. While I get why EA has moved to releasing the game right before the Masters, it is a move that actually leaves me less likely to buy it every year. I like the game and it is fun, but if the choice is TW on the Xbox or me sticking a real tee in the ground and playing, I’m picking real golf every time. TW, however, is a great way to spend an hour or two some night or weekend in the winter. So there you go. We will see if I buy. If you want to learn a little more about the game and the “Tiger Legacy” mode that’s new for this year, here’s a Q&A that ESPN.com did with Tiger himself a few weeks ago. If you have Kinect for Xbox (I don’t), here’s a look at the new Kinect features.